Parking cards can be purchased at the service desks on the ground floor in the Ziggo Dome and are available for the following parking places: P1, P2, P3, P4, P5, P6, P7, P10, and P18. When the event is organised by MOJO concerts parking cards can also be purchased online via ticketmaster.nl or shop.onlineticket.nl. We don't sell parking tickets for P Dome. Parking is also available in the P+R network: easily park your car on the edge of the city and continue by public transport. More information about parking and a map with parking locations can be found further on this page. Check the page of the event you are visiting for the latest updates. Onder de Amsterdam ArenA vind je parkeergelegenheid P1/Transferium. Op dagen dat er in Ziggo Dome / ArenA een evenement plaats vindt, is de P+R gelegenheid in P1/Transferium gesloten. Vindt er geen evenement in de ArenA plaats, maar is het wel druk in de omgeving? Dan raakt doorgaans deze parkeergelegenheid snel vol. You can carpool to work but also to a concert or event! Whether it is to enjoy the company, share the costs, relieve traffic jams, or to save the environment, any reason to carpool is a good reason. You can also share the time you need for preparatons: one can arrange the tickets, another plans the route, a third one finds the best place to park. Is there a fourth person in your party? That one can buy the first round of drinks! There are several options for dropping off or picking up passengers at the Ziggo Dome. 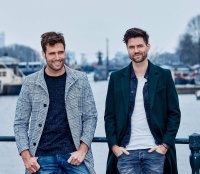 We recommend you use parking garage P5, located in Villa ArenA, for passenger drop-off at the Ziggo Dome. You can drop off passengers at De Entree 222, situated next to Villa ArenA. Just follow the yellow signs marked ‘Afzetten evenementen’ to reach De Entree (see map). The Ziggo Dome is just a few minutes away from De Entree on foot (please consult the map for route details). Drop-off at De Entree is free. Please be advised that these spots are only suitable for brief stops and cannot be used for parking. We recommend you use parking garage P5, located in Villa ArenA, for passenger pickup at the Ziggo Dome. For pickups at the Ziggo Dome we recommend you park your car in parking garage P5, in Villa ArenA. Just follow the yellow signs marked ‘Ophalen evenementen’ (please consult the map for route details). 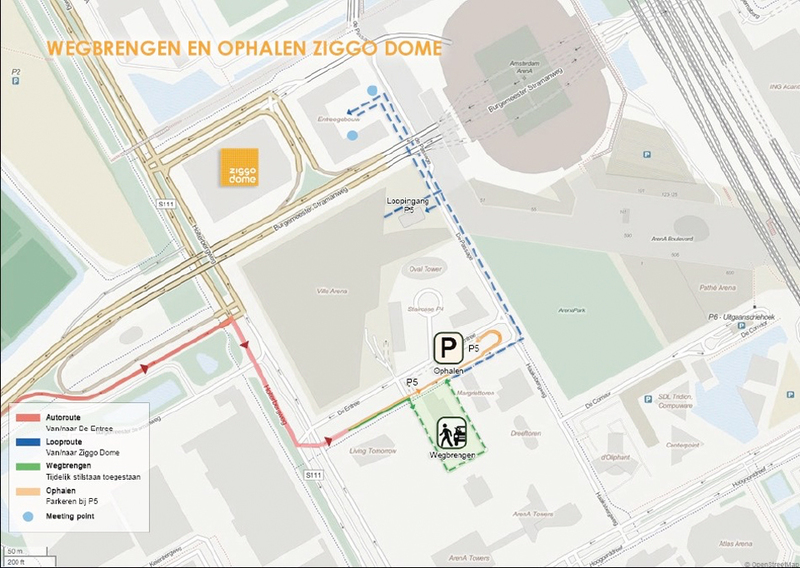 The Ziggo Dome is just a quick walk away from the parking garage (please consult the map for route details). Parking for passenger pickup costs 1 euro for the first 24 minutes, then 1 euro for each additional 25 minutes (standard parking rate). An ideal meeting point is the large post with green signage opposite the Ziggo Dome, or near Club Ziggo, which is situated to the left of the Ziggo Dome’s main entrance. De Entree 222 can no longer be used for passenger pickup after the concert has ended.